Danse Cachemirienne. Environs de Simla dans l’Himalaya (Août 1842). bl.uk > Online Gallery Home	> Online exhibitions	> Asia, Pacific and Africa Collections	> Danse Cachemirienne. Environs de Simla dans l’Himalaya (Août 1842). 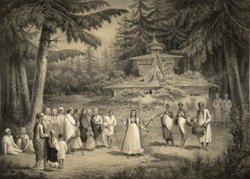 Lithograph of a 'Cashmiri dance' in front of a temple near Simla by L.H. de Rudder (1807-1881) after an original drawing of August 1842 by Aleksandr Mikhailovich Saltuikov. Prince Saltuikov's voyage of the Himalayas in September 1842 commenced at Shimla. This hill-station, now the capital of the state of Himachal Pradesh, was a popular resort with British residents of India from the 1820s and the summer capital of British India from the 1830s thanks to its cooler climate. In the mountains near to Shimla there are a number of temples and waterfalls. This temple was also drawn by Mrs Scott in 1853 and photographed by Samuel Bourne in 1863.